Pool only does not include liner. Pretium Above Ground Steel Pool includes the Pretium Pool and skimmer only. The Pretium will give you and your family many years of fun in the sun. Manufactured by a leading above ground pool company, the Pretium combines excellent quality with a very affordable price. The top ledged and uprights on every above ground pool undergo a state of the art protective treatment process in addition they are coated with Texture-Kote. This combination provides incredibly long lasting all weather protection with added resistance against corrosion, scratching and damaging UV rays, Our unique quadra-fold system and bolting pattern provides maximum wall joint strength. 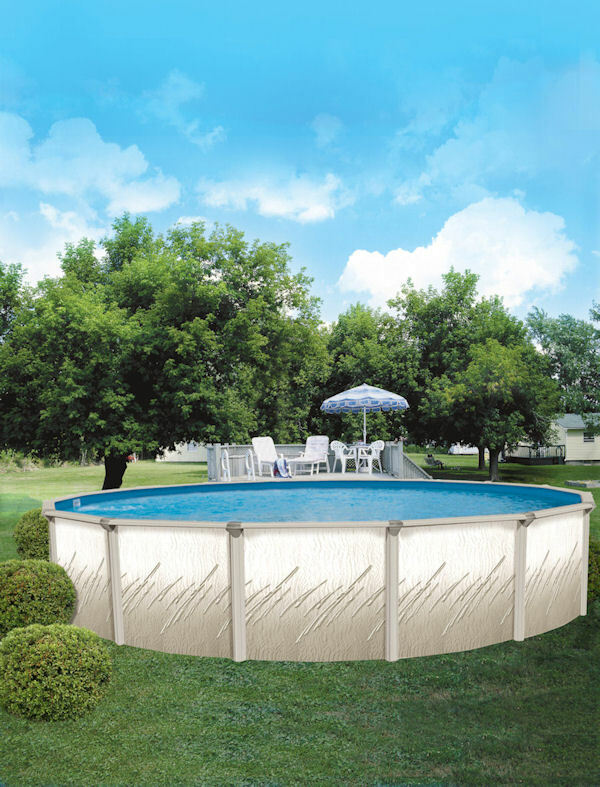 Pool walls are corrugated for increase durability and resistance to ice and impact damage. Only our pools feature the self supporting omega stabilizer bar developed to simplify homeowner installation. The ease of assembly has made our pools the number one choice of many professional installers. The Pretium is made in the USA and is backed by a 30 YEAR LIMITED WARRANTY. Available in 52” deep and a variety of rounds and ovals to fit your backyard.